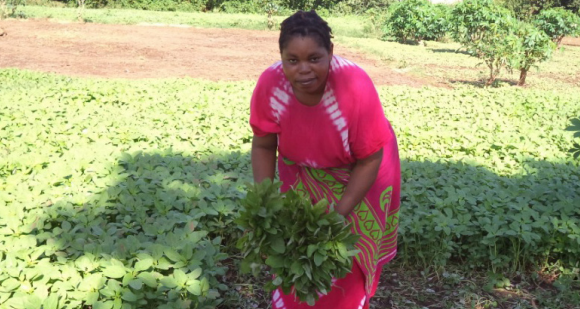 “I am a kitchen gardener, a mother of two and I live in Morogoro, Tanzania. I own half an acre of land in which I used to cultivate sweet potatoes, and other vegetables using traditional agricultural methods. I would sell the vegetables and sweet potatoes to the nearby local market. However, I could only yield just enough for my family’s consumption, and could never generate an income by selling my crops. I did not have enough technical skills or knowledge on modern farming, which is why I did not have a good crop production. I first heard about BRAC GPAF from a neighbour. In April 2012, I went to their regional office and enlisted my name. After joining, I received three days’ training on kitchen gardening that helped me improve my technical skills. Later BRAC provided me with quality seeds and fertilisers to use in my new vegetable farm. I started with a vegetable plantation on my half-acre land, and for the first time, I saw better vegetable production. Then I rented another half-acre to expand my farm and grow Chinese cabbage, figiri and amaranths. I have learned that amaranths are high priced and have short durability, which is why producing them is more profitable. Now, 70 per cent of my garden is comprised of amaranths. My profits have increased greatly. I produce crops worth TZS 417,312 to 521,640 (£128 to £160) every crop cycle. I earn a profit between TZS 260,820 to 365,148 per cycle (£80 to £112). I can now afford to hire a bike to take my vegetables to the market.